"God bless your company. I am so glad you make good Christian movies available to us." 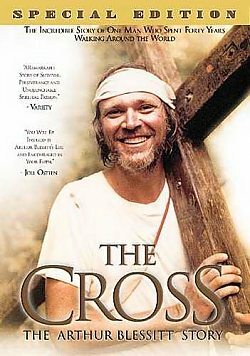 The incredible story of Arthur Blessitt, the man who spent forty years walking around the world...carrying The Cross. Arthur Blessitt is one of the most unique individuals to walk the face of the Earth. In fact, he is the only individual to ever literally walk the face of the Earth. Inducted into the Guinness Book of World Records for the "World's Longest Walk," Arthur has spent the last 40 years traversing all seven continents, 315 countries, island groups and territories. He’s survived war zones, firing squads and beatings, blazing deserts and deadly jungles. Yet perhaps even more amazing than the 38,102 miles he's tread is the completely unquantifiable number of people that have been the focus of his journey along the way. He's dined with presidents and peasants, been greeted by hundreds of thousands in jammed packed squares and walked deserted highways…all for one grand purpose. You will laugh and cry at the inspiring story of the man who set out on a life-long mission to carry a symbol all too often associated with judgment and hatred and reinterpret it to the world with a smile and a message of peace, love and hope. 9-part series "How to Share Jesus"
Read more about Arthur's journey in this article by Stephan Blinn. Will we, like Jesus, take up our personal cross and follow him? Vision Video/Gateway Films is celebrating its 40th Anniversary with this Special Edition 2 DVD Set! Share the message of The Cross with your friends. A must see movie for anybody who wants to see what one person can do to spread the Word of God over a 40 year time span.